If you feel you are not quite ready for a surgical face lift procedure why not have an assessment to determine your suitability to a Non-Surgical Face Lift? Because, by expertly employing BOTOX®, the complete range of Restylane® Fillers including the revolutionary new SUB-Q you can lift areas of your face, soften and/or remove wrinkles, drooping eyelids and even a sagging jawline to help capture a more youthful appearance. BOTOX® is a brand name for the purified form of botulium toxin Type A that is produced by the bacteria, Clostridium Botulinum. The safety profile is considered to be excellent. It has been used for patients with various conditions for over 19 years in over 60 countries. There can be a slight drooping of an eyelid or eyebrow following the treatment but this is temporary, lasting 1 to 2 weeks and is rare. Facial expressions occur when the brain sends a signal to a muscle tissue. BOTOX® blocks impulses from the nerve to the tiny facial muscles that are related to expression lines. This relaxes the muscles to stop them contracting, leaving the overlying skin smooth and unwrinkled. It works only on the specific muscles injected leaving surrounding muscles to function as usual, producing normal facial expression without the wrinkles. A very small amount of BOTOX® powder is diluted with saline and injected very precisely into several locations. Associated pain is minimal, many patients describing it as an ant bite sting for a few seconds. The treatment takes around 15 minutes depending on the number of areas requiring attention. It takes 2 to 3 days for it to begin taking effect and up to 7 days to see the full result. Generally for frown lines between the eyebrows, horizontal forehead lines and crows feet (small smile lines around the eyes). It is also increasingly being used to reduce neck lines and in brow lifts to achieve a more youthful arched brow which rounds and softens the eye. Doctors have also reported good results in the nasolabial folds between the nose and mouth and for perioral lip lines (“smokers’ lips”). The advantage is that it is temporary. The effect lasts for 3 to 5 months depending on the individual. Once you decide you like the effect you can have repeat treatments and increase the number of facial areas you wish to treat. Early clinical studies indicate the duration of effect increases over time. RESTYLANE® and PERLANE® both products of Q-Med Esthetics use a natural material known as Hyaluronic Acid, to restore youthful resilience to selected areas of your skin. Hyaluronic Acid is one of very few substances that are identical in all species and tissue types. Q-Med Hyaluronic Acid however is unique. It is the only NASHA Non-Animal, Stabilized, Hyaluronic Acid available and remains in the system for many months as opposed to non-stabilized Hyaluronic Acid products that last for only a few days or weeks at most. ARE RESTYLANE® AND PERLANE® TREATMENTS SAFE? Q-Med-Esthetics are made under stringent control and have a long record of success with many satisfied users. More than 300,000 people have been successfully treated in more than 40 countries around the world. HOW DOES RESTYLANE® AND PERLANE® WORK? Water is the source of all beauty. Water gives life and resilience to your skin. Therefore Q-Med Esthetics use their Hyaluronic Acid, in an injected form, to bind with the water already in the skin in order to lift and create new firmness. During the treatment a crystal clear gel is injected into the skin in tiny amounts with a very thin needle. The ability of Q-Med products to integrate with adjacent tissues allows the free passage of vital nutrients like oxygen and hormones to pass between fragments of the gel. The result is natural healthy looking skin. 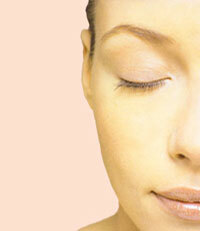 For wrinkle treatments no pain is relief is generally necessary. When enhancing the lips however a local anaesthetic is often administered. After the treatment some common injection-related reactions may occur like redness, pain, itching, discolouration and tenderness but tend to resolve themselves on average within a few days to a week after the treatment. The degree of the reaction if any will of course depend on the individual. WHERE CAN RESTYLANE® AND PERLANE® BE USED? RESTYLANE® is generally for wrinkle correction around the eye area and lips. PERLANE® is generally used for shaping facial contours, such as cheeks and chin, for correcting deep folds and for volume augmentation of the lips. HOW LONG WILL A RESTYLANE® AND PERLANE® TREATMENT LAST? One of the great advantages of the Q-Med Esthetics product range is that it is long lasting but not permanent. How long a treatment holds its effect depends on the individual and this in turn depends on age, skin type, life style and muscle activity. In the case of wrinkles and facial contouring most patients choose to have follow-up treatments 6 to 12 months after their initial treatment. In the case of lip treatments a follow-up is normally required after about 6 months.